The union at the centre of the rail dispute is calling for a special summit to break the deadlock. Three days of strike action on Merseyrail and Northern Rail are planned for this week. A deal has been agreed in principle to resolve a long-running dispute over guards on trains at Merseyrail. Passengers will face more disruption today as rail workers stage another strike in the row over the role of guards on trains. Members of the Rail, Maritime and Transport union (RMT) on Arriva Rail North will walk out on May 24th and 26th. They're angry at plans to introduce driver-only trains. This dispute started more than two years ago and affects five train operators in the UK. To help keep you on the move during RMT strike action on Thursday 24 and Saturday 26 May we will run as many services as possible each day. On Thursday, the majority of available trains will operate between 7am and 7pm as we focus on running as many trains as we can to get you into work and home again. It comes on a week of major disruption after the new timetables were brought in. Meanwhile, Northern is today involved in urgent talks with the Transport Secretary over its performance record. Rail dispute: talks to continue. Merseyrail have been meeting members of the RMT union today to discuss ways of resolving the long-running dispute over driver only trains. for the past 12 months there's been a series of walkouts by rail staff over plans to do away with guards on trains. Following talks between the two today both have agreed to meet again within the next 7 days to continue discussions in a bid to find a solution. olution. “I am pleased at the positive progress that has been made in the discussions with the RMT with the aim of resolving the current industrial dispute. Rail passengers across the North West are facing their third day of disruption in a week because of strike action by staff. RMT Union members on Merseyrail and Northern Rail are walking out for the 13th time in a long-running dispute over the role of guards on trains. Merseyrail insists it wants to talk to the union. Northern says it is aiming to maintain services today. Rail users are facing more disruption this morning as the second day of strike action this week gets underway. RMT members on Merseyrail and Northern Rail are walking out in a dispiute over the role of guards on trains. Merseyrail say they want dialogue with the union and Northern say they'll aim to maintain services. We are doing everything we can to keep our customers on the move during the three days of industrial action affecting our network. We are still working to determine the exact services we will be able to operate, but those trains that do run will be on an amended timetable and are likely to be extremely busy. RMT strike action: how could I be affected? Rail passengers in Manchester this morning had mixed feelings about three days of strike action which the RMT union has planned for this week. Union members from Merseyrail and Northernrail are protesting over the role of guards on trains. 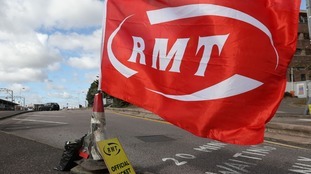 The RMT union is calling for a special summit to break the deadlock. The RMT union is holding three days of strike action this week in a dispute over the role of guards on the trains and fears for "rail safety". Union members at Northern and Rail and Merseyrail will strike on Monday, Wednesday and Friday. A Department for Transport spokesman said the five franchises will "keep passengers moving" during the strikes.